PRODUCT DESCRIPTION: This liquid is mixed with water and is the perfect solution for giving your pine straw and mulch a refreshing look. 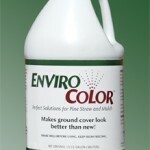 It is a non-hazardous, environmentally friendly solution of permanent color. 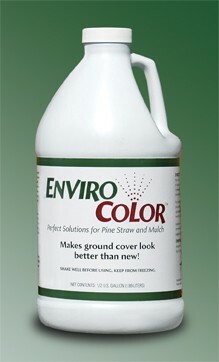 This product comes in different colors which are listed below, however the only size available is the 64 oz container. WHERE TO USE IT: Outside in your areas of the garden where mulch and pine straw is used. To avoid permanent staining you should avoid spraying this on any porous surfaces, if sprayed wash off with water immediately. RATE OF APPLICATION: Mix 3 – 4 oz. in a gallon of water to treat 200-400 sq/ft. Coverage will depend on groundcover quality and desired color absorption.